Meet Sam Forman and Jam Jones. A year ago they were sat in a pub in Vauxhall coming up with ideas for an adventure. 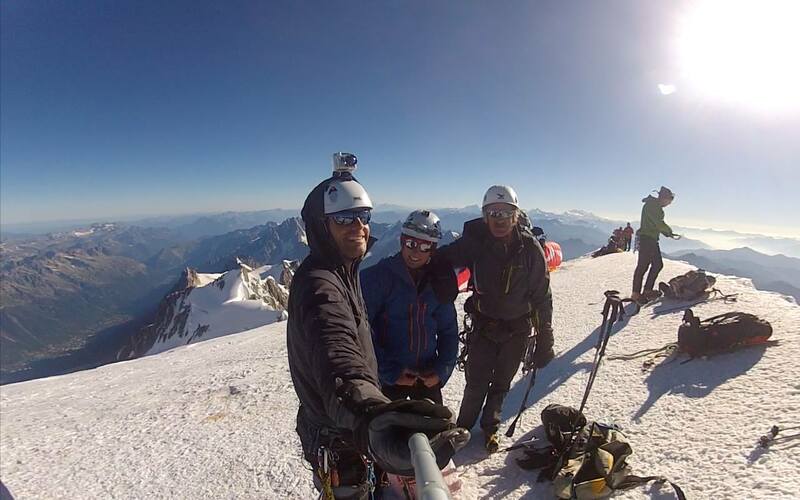 This week, we met them for the first time in Chamonix to begin our training to help them fly from the summit of Mont Blanc in aid of Macmillan Cancer Support and the Alzheimer’s Society. Sam has cycled from London to Chamonix, where he rendezvoused with Jam ready to climb Mont Blanc and fly from the 4810m summit. They haven’t let the fact that they’d never done any mountaineering or paragliding before put them off! Some people may see that as foolhardy. But the fact that they’ve got this far just goes to show what a can-do attitude can achieve. They’ve both been training for this for months, so are both incredibly fit. But as we discovered for ourselves recently, getting properly mountain fit is almost impossible in the UK. There‘s nowhere you can climb 1,000m in one go! And there’s definitely nowhere to get acclimatised to being at altitude – without that, just breathing at 4,800m will be challenging, even before you factor in the physical and mental exertion! Within 2 days of Sam’s arrival a window of opportunity appeared for the summit seemingly out of the blue. From our perspective, this was almost the worst possible timing! Along with Sam, we had to sit by and watch our friends set off for the summit without us. 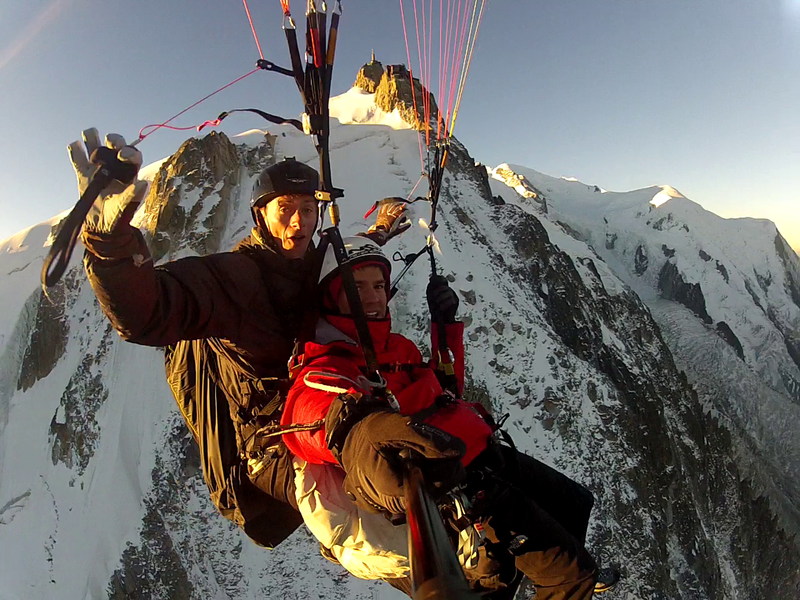 Dan and Shane had been in Chamonix for weeks training and getting used to high altitude. Irwyn had joined them on many of their training expeditions and couldn’t resist it as a training opportunity for the forthcoming flight with Sam and Jam. Whereas we had just arrived from the UK. But we made the most of the weather window anyway – Sam certainly didn’t get much chance to rest from his 1,000km bike ride! We headed up to the Aguille de Midi with Dan, Shane and Irwyn, put Sam on a rope between the two of us and headed down the arête then across the ice to the Cosmiques refuge. That arête was my first walk in crampons two years ago – and despite the experiences I’ve had since, it still scares me! So I can imagine how Sam felt – legs still quivering from his time on the bike. Looking from the hut at the route to the summit, I was glad not to be going. We could still see the scars of the serac fall which had killed 4 people less than two weeks earlier. I’d seen photos of ice walls on the route which were certainly beyond my level of technical climbing skills. The guys set off for the summit at 2am the following morning. We got up at 5am and headed out into the dawn glow. 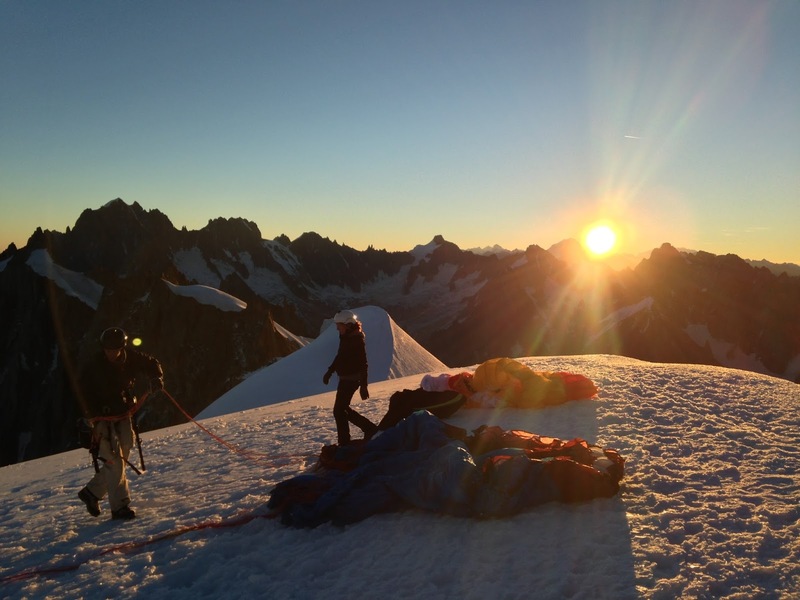 At the bottom of the Aguille de Midi arête, Sam had his final briefing for his first tandem flight. 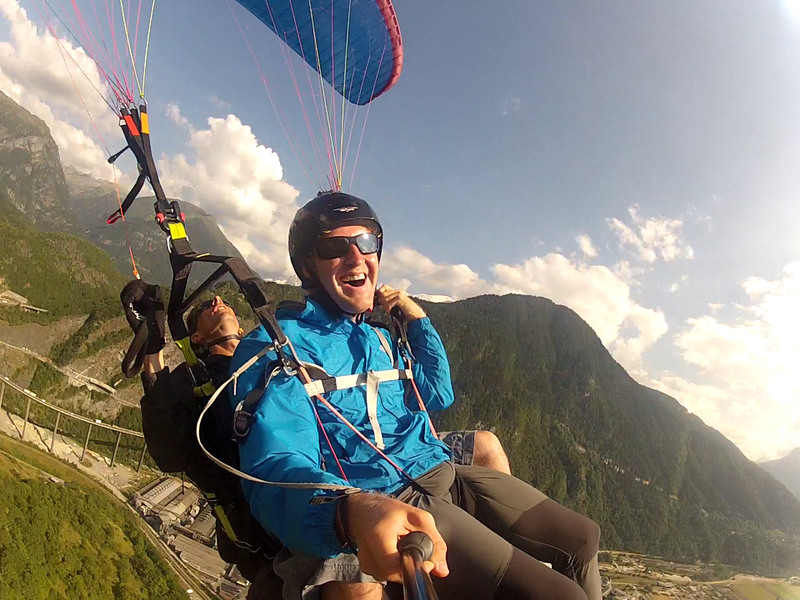 Climbing kit and ropes in the harness meant it wasn’t the most comfortable flight ever, but there really can’t be many people who can say their first ever flight on a paraglider was off the Aguille de Midi at dawn – the first wing above Chamonix that day. While I was flying down soon after, I saw the first gliders launch from the summit. On landing, we all headed back to base to pick up Jam, just arrived from the UK, then back to the landing field with cold beer to meet Dan, Shane and Irwyn as they landed. Since then, we’ve been doing something every day – getting up as high as we can, hiking, flying, drilling the boys on basic mountaineering and paragliding. Now we’re waiting for another weather window. Last year, there was only one day where it was possible to fly from the summit. Dan and Shane, who were here then, missed that opportunity because they weren’t yet acclimatised. Jam and Sam have worked incredibly hard to get this far, so we’re hoping the same won’t happen this year. But really all we can do it wait and hope and keep ourselves as fit as possible in the hope that our turn comes next week! 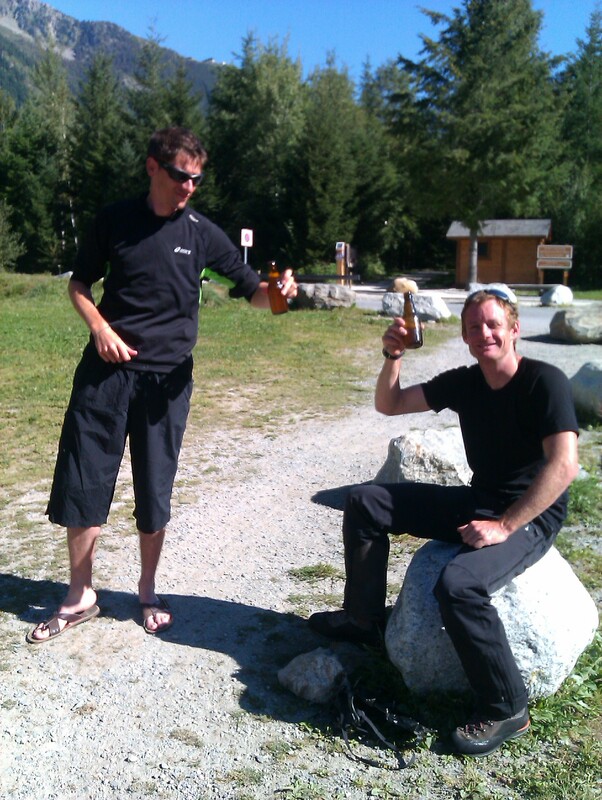 Sam is posting updates of their adventure at http://mtblanc2013.blogspot.co.uk – they’ve got some great pictures and details about how you can sponsor them.